Let’s kick off this collection with what was once considered the ultimate in foyer design. Check out that staircase and ornate woodwork. It’s beautiful for sure, but not for everyone and not for every house. Keep scrolling for more current and contemporary foyer ideas. With a two-toned wooden floor and wooden stair treads, this house maintains the essence of the old wood-themed foyers. But what makes it fit for contemporary designs is the delicate railing and the use of excessively light colors for the walls and window frames. Best for houses with a high-rise ceiling, this foyer speaks of beauty and sophistication. 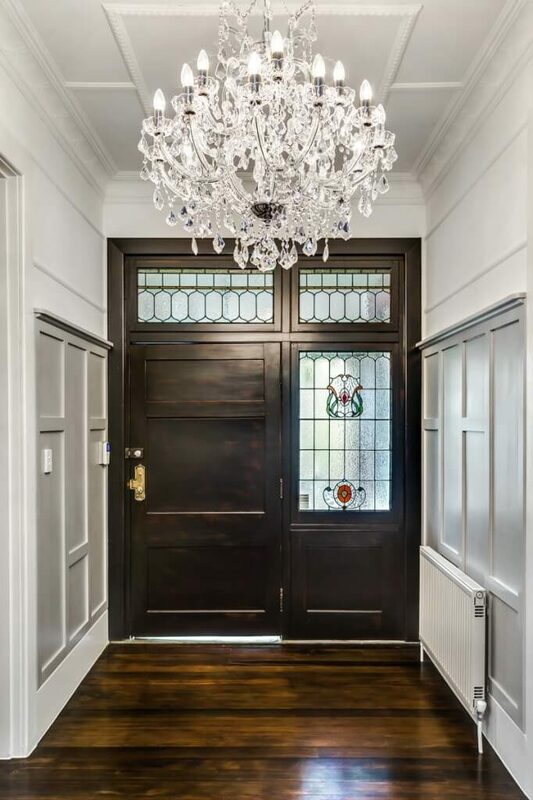 Vintage-style light fixtures with a magnificent chandelier coupled with indigo glass windows against crème-colored walls form the perfect entrance to a grand house. 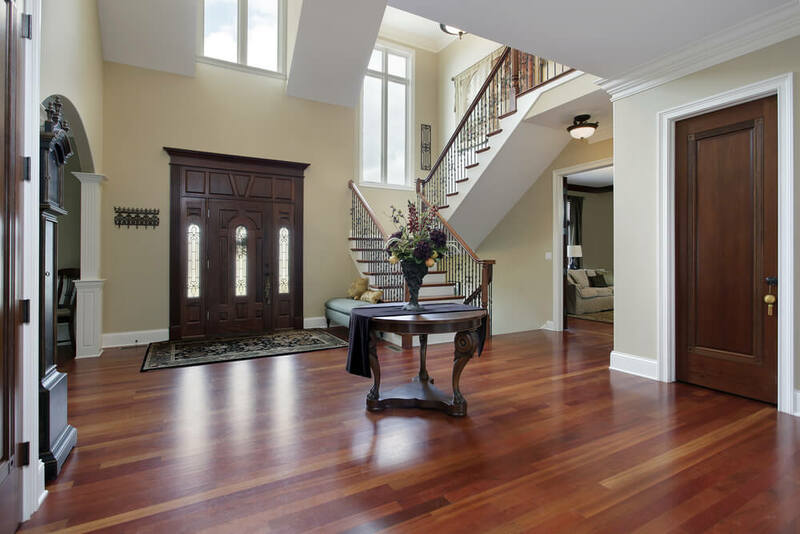 While not ornate or ostentatious or large, this foyer is nicely appointed with wood flooring, a quarter-turn staircase and entries flanking each side of the space. Source: Redfin. See the rest of this home here. 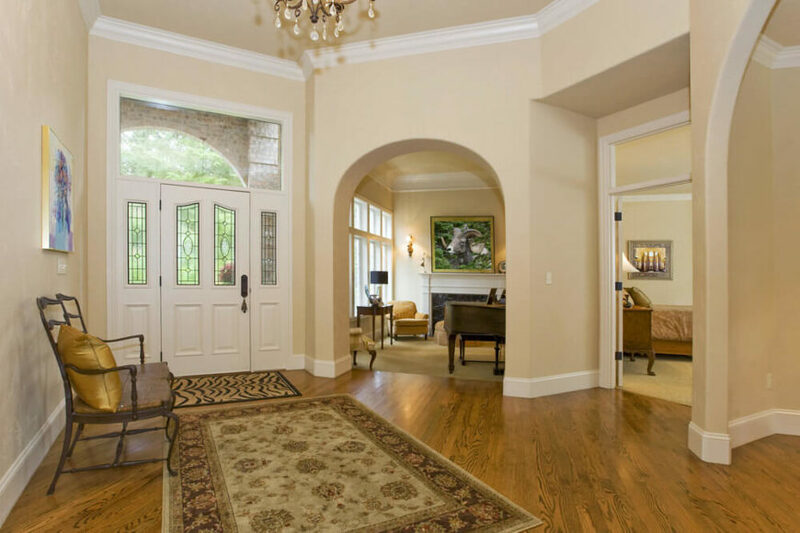 Simple and elegant are two words that best describe this foyer design. Ideal for people who prefer minimalism and clutter-free living, this foyer strategically combines wooden elements with lots of whites to create an entrance that is traditional and modern at the same time. This foyer embraces the old world charm by going all brown and golden. 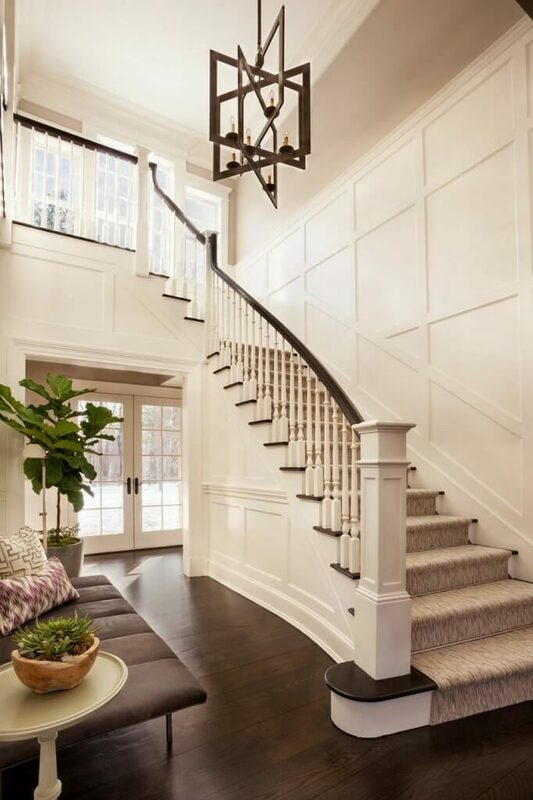 From the floor to the stairs and then the coffered ceiling, deep chestnut wood is generously used along with chocolate-brown foyer furniture and lantern style lights to make this foyer truly attractive. 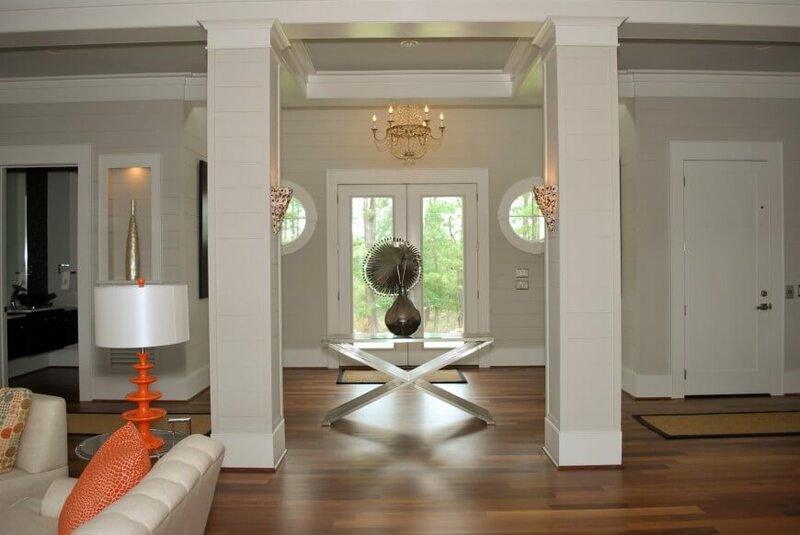 This house uses ivory white shades against the deep mahogany wood resulting in a warm and homely foyer. A sleek couch, geometric chandelier and some pots of greens bring life to an otherwise plain space. This Italian villa style foyer houses a decorative railing, a plush silken sofa and a grand flower vase to highlight the pallid marble floor and muted beige walls. This rustic foyer is completely wooden-themed except the main wall facing the entrance. An ornate wooden table set against the stone wall with a large framed mirror is a unique way to welcome the guests. This monochromatic foyer seems like the ideal design for studio apartments. Jute chenille baskets, a sleek and slender metallic lamp and a round hanging light make great adornments to a bare space. 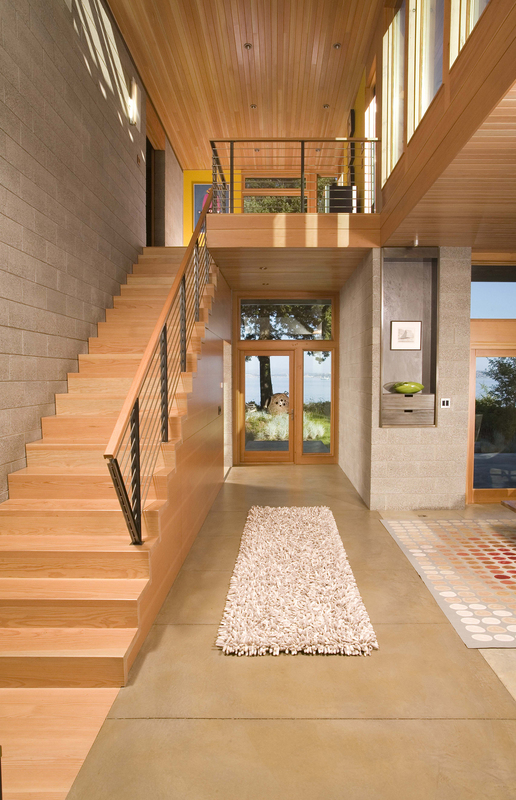 This foyer redefines the idea of a rug. Instead of runners, it ‘carpets’ the entrance with a zigzag mosaic tiled floor that matches the chestnut furniture and railings. Wall-length windows opposing the foyer provide a brilliant view of the lush scenery outside and give the place a more open look. This dual toned foyer perfectly balances black and white which are the go-to shades when it comes to interior designing for modern living. A pot of greenery adds a hint of color while the flat-bottom vases are a chic addition. This foyer makes a dramatic use of lighting. The hallway is kept dark with dim lights and a deep black-brown wooden wall. The abstract painting accentuated by the hanging lamps and the cube-shaped seats add an artistic touch. This foyer is full of luster and shine. Although no decorative item is used, the trio of long cylindrical lights in the centre of the place and the fascinating use of a wooden wall makes this foyer stand out. This foyer is designed to give a view of the entire house proudly. Open walls give a peek into the living and dining room while the sandy wooden floorboards are kept common to all the rooms for a truly integrated look. 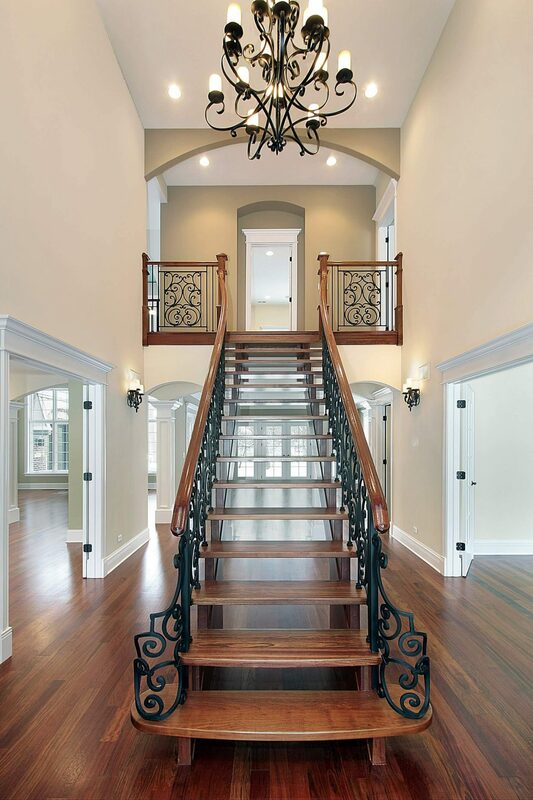 This foyer is simple yet majestic at the same time. A small leather seat is a stylish as well as a functional addition while the use of skin-colored tiles amidst wooden floorboards creates an illusion of a carpet. The bunch of glass lamps and a pot of green also make great adornments. This foyer seems more like that of a hotel room instead of a residential house. From lustrous marble floors and ceiling lights to the blood red geometric tiled wall, it is filled with extravagance that will wow all observers. This modern house pays tribute to the Stone Age with its gray and white walls and stone floor. Add some stone statues and your guests will feel like they are traveling back in time. This foyer design is overflowing with beauty and grace. Never-seen-before cobalt blue spiral staircase seems like a flowing waterfall while the wooden railings match the sandy floor and the plush sofas in the living room. This design doesn’t really consist of a separate space for a foyer. Instead, it opens fully into the living room and gives a complete view of the entire floor. 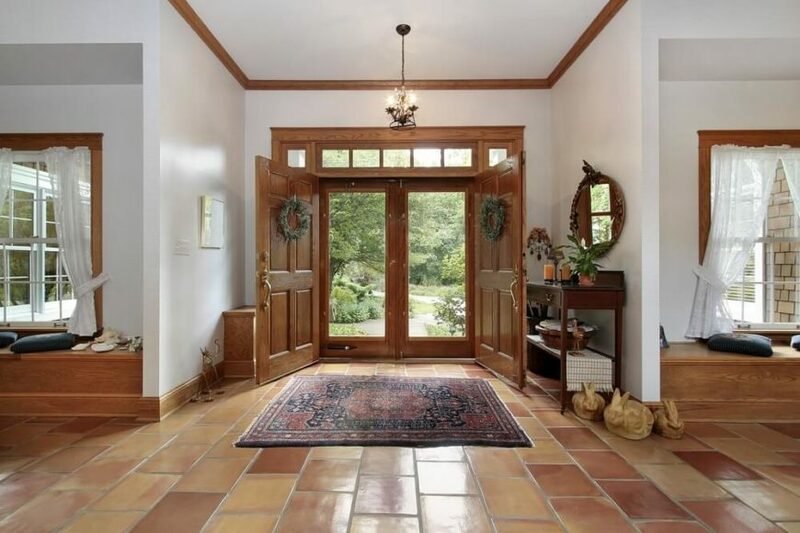 This foyer is so open and wide that it’s hard to separate it from the rest of the house. Grand floral carpets line the floor on both sides of the entrance while the imposing seats offer a place for anyone to relax for a while. For a house that wants to go big on style and grandeur, this foyer design is the ultimate choice. While the various plants add life and color, the place uses a mix of various hues of brown for a really magnificent entrance. Take notes from this foyer on how to incorporate bricked walls in modern designs. This entryway is all about symmetry and balancing things right. The geometric patterned pillars and the indoor plants on either side of the walkway automatically create a path that gracefully welcomes all visitors. This foyer is truly different from the rest. A large ceiling-to-floor wooden shelf partially shields the main room from the entrance while also providing ample amount of space to store any items if needed. Despite the white walls, this foyer is full of life and warmth. While the windows provide a view of the greenery outside, a large central vase placed atop a bright red and white rug create a cheery atmosphere. This foyer uses rustic elements such as the dried foliage and raw wood stairs, but still fits into modern designs because of the blend of different textures and artistic rudiments. Gray tiles on the floor and the black door frame match the painted backdrop really well. This foyer will click well with all Titanic fans. Completely wooden stairs and the two-toned wooden floor which is further highlighted by the wooden piano, foyer table and the doors give a nod to the charm in antique architectures. This foyer in a house in Greece uses the traditional crème and white shades in a wide circular entrance. The ultra-hip golden pendant light fixture and the sleek wooden bench match the subtleness in the place. This Aztec themed foyer merges really well with the mudroom to create a place that’s fashionable yet highly functional at the same time. This foyer design is as unique as the floor plan itself. The heavy grills might give a gothic look in a closed space but since it surrounds the path leading into the basement in this house, the bounded look is avoided completely. The walls foyer tables are kept plain to counterbalance the heavy embellishments. Perfect for nature lovers, this foyer provides a dazzling view of the lush green scenery outside. Wall-length windows give an unhindered view while the interior being void of decorations means that nature takes the centre stage. This design seems more like a Japanese Zen garden than a foyer. And it probably is a meditation haven. But you can take ideas on how to merge wooden partitions with wooden pillars and floor-length windows to create a serene and peaceful place in your house. 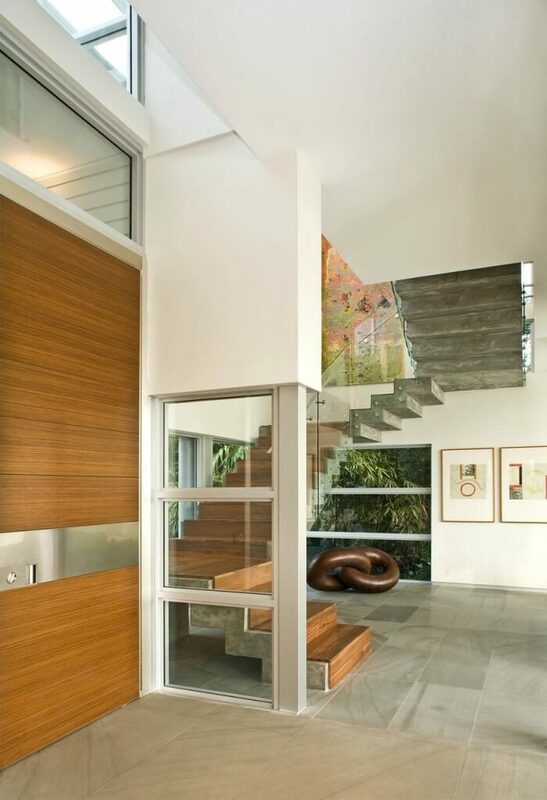 For a house located on a hillside, this foyer provides a peek of the outside from the glass door. The soft floor rug and the dried foliage are a dead giveaway – quite literally! By using similar foyer tables outside each door that leads to different rooms in the house, this foyer seems as if it’s a corridor of a decent hotel. With a rich hazelnut wooden floor and long entryway, Chesterfield style seats, this foyer boasts of stately opulence. A sunroof and small ceiling lights provide the necessary lighting. This lavish foyer is all about pomposity. While the walls are pastel colored, the ornate furniture and flamboyant stairway along with the extravagant chandelier and lustrous marble floor add a ton load of magnificence to the place. Bright and playful are what best describe this foyer. Intense red floorboards and the vivid yellow walls are further enhanced by the matching furniture to create an entrance that will surely dazzle your guests at the very first glance. This foyer is so heavily wooden-themed that it seems to be carved in a giant tree trunk itself. These rich shades of gingerbread are unlikely to suit everyone but it’s perfect for lovers of rustic interiors. This drenched-in-red entryway is ideal for houses situated in cold, snowy regions because it provides a warm and cozy feel that is hardly attainable by other ways. This entrance for a small Middle-Eastern hotel boasts of cheer and merriment. From the red flower pots and red pillars to the red rugs and red cushions, this is how you can use a single color in abundance and still manage to shine. Another example of a warm and cozy entrance, this foyer design is perfect for cottages. This house turns the foyer into a mini living space by placing sufficient chairs for house members to sit and chat while enjoying a view of the outside. This foyer immediately gives a full view into the grand house with double stairways leading upwards and a doorways leading further into the house. 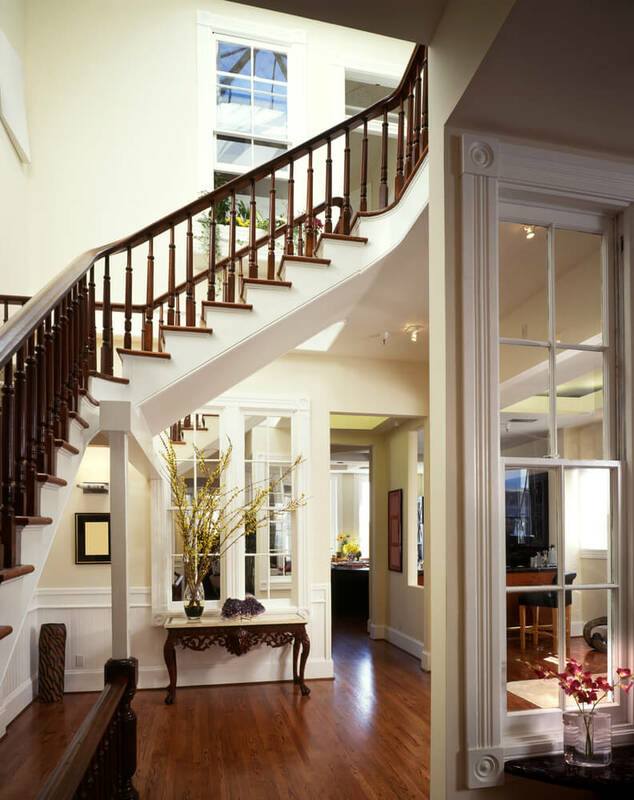 This fascinating foyer gives an unhindered view of the multiple floors of the house. Under-the-stair light fixtures are a brilliant way to add extra lighting and grandeur to the place. With pastel pink walls and tiles of the same shade, this foyer is all about decent and simple entryways. A chaise lounge with lots of plush cushions and a small birdhouse provide a place to sit comfortably and relax as well. This seems like a foyer from an old England house. The stairway is spiral and housed near the corner to make the entrance truly spacious and functional for small gatherings and the likes. This museum-styled foyer uses antique decorations, a rug with stone-age type drawings and embedded lights for a really special look. 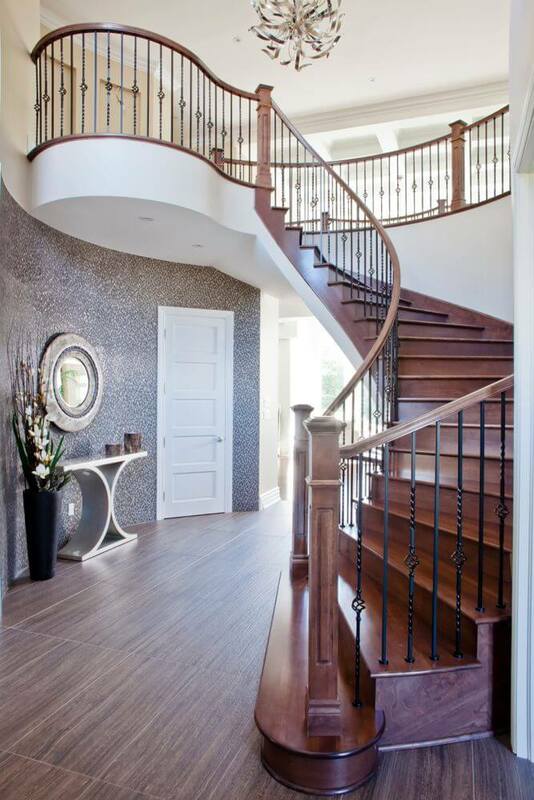 This foyer design shouts modern interiors at the very first glance. Black stair treads with white risers are the perfect way to match the monochromatic tones. With a low ceiling, wide-angular design and shades of mild blue, this foyer reminds one of a cabin in a luxury cruise liner. This small foyer balances brown and blue in just the right proportions. The tile work at the entrance is a unique way to replace conventional rugs. This foyer design comprises of two-toned stairs and a high-gloss marble floor that is a unique contrast against the plain matt blue walls. A bright and multicolor patterned rug is the perfect way to add some brightness in a dark wood-based entryway. This simple yet mysterious looking foyer is best suited for people who love ancient art in modern designs. This majestic entrance welcomes the guest with open arms by giving a full-fledged view of the living room and beyond. Glass railings are a clever way to counterbalance the heavy wooden frames. If you love the deep black-polished mahogany wood yet don’t want the entrance from becoming too dark, then couple the wooden wall and window frames with white railings and milk tea floorboards like shown above. Black and white is a common color combination so this house uses black with vanilla hues for an equally alluring look. An upholstered red velvet seat, a glamorous wall mirror and a pot of green take this foyer to a whole different level. 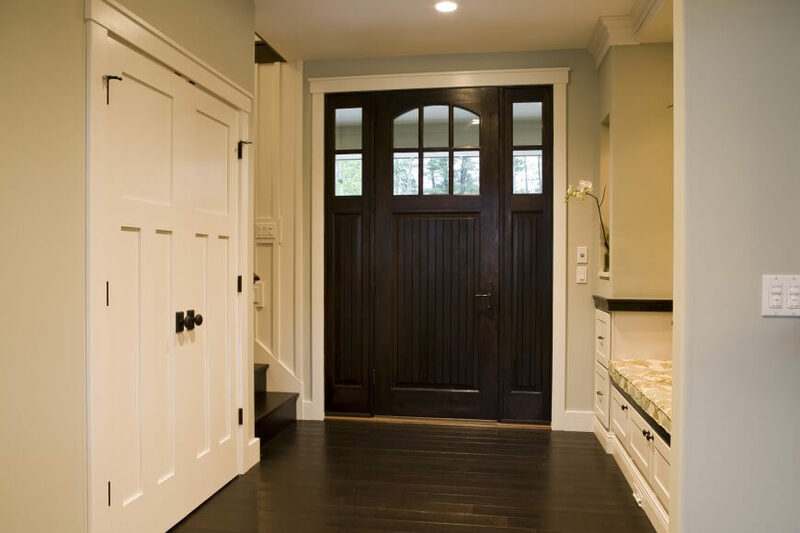 With a dark backdrop combined with plain white walls and door frame, this foyer makes an elegant entryway for small homes. From milk-chocolate brown walls and two-toned floorboards to matching center table and center rug, this foyer is bold and beautiful. This foyer uses a giant ancient ornament against a glass wall overlooking the bright greenery outside to create a sense that one is perhaps visiting a Buddhist temple. This foyer combines elements of the Victorian era with contemporary living to create an entrance that will amaze everyone with its fragile yet stunning decorations. For great foyers, it is important to consider what goes into the central space. This villa houses a small garden right in the center to create a lasting impression on the visitors. Simple yet lively best describe this entrance. Lots of indoor plants that complement the paintings of wild birds and the marble foyer table at the side make this a homely entryway. A vintage hanging lantern illuminates this entrance with fascinating designs on the ceiling while the red brick floor is a nice replacement to the traditional wooden floorboards. Comprising of a mini fountain with water overflowing into the entrance, this foyer is nothing short of beauty and extravagance. A bit of wild greenery goes a long way in adding life and cheer to the place. This entrance is only about minimalism and nothing else. Glass walls provide an impressive view of nature while the stonework matches the gray floor well. This entrance takes rustic charm to a completely different level. The twisted trunk is probably fake, but it’s an interesting item for an entrance nonetheless. This entrance merges different textures artistically. The gray mosaic stone floor is a soft contrast against the honey wooden doors. The large ceiling light illuminates the place and creates a welcoming environment. This foyer balances the stone walls and muted beige floors by subtle hints of color here and there. For instance, the colorful wall set at the entrance and the pastel pink carpet near the door. Many homeowners seek a touch of serenity in the entrance and the best way to achieve that is to keep the foyer void of unnecessary items and decorations, just like this design. This space on the top floor of a house displays nothing but a battalion horse on a heavy wooden table that perfectly matches the multi-toned floorboards beneath. This modern foyer design uses a two-toned staircase with black wood panels at the side. Add in an abstract painting and a contemporary decorative piece and you have a chic entryway. This entryway is gothic and completely black. It might not create a very welcoming style but if the homeowner likes it, who’s there to stop them? This entryway seems like a magazine picture, although it’s from an actual house. A bright pink door couple with coral blue seats, a forest green wall with an intense yellow backdrop – various colors are at pay in this foyer to make it look stunning. This foyer design is best suited for homeowners who are all about organic living. The beige wooden floor is a stark contrast against the deep black window frames. Together, all the elements create a very open and airy entrance. The glass doors in this foyer provide a breathtaking view of the outside while the giant throw rug at the entrance comprises of a design that makes it seem as if there are clouds beneath your feet. What’s unique about this foyer are the red carpeted stairs that counterbalance the brown and vanilla hues. For houses with coffered ceilings, keep the entrance plain with a large flower vase at the center as in this design. This foyer generously houses various forms of greenery to make a lively entrance. Keep it simple with a grand piano and few decorative vases like this foyer. This entrance comprises of an elaborate and stately stairway that is well lit from the ceiling lights. This monochromatic foyer is the perfect example of how to balance the ultimate duo of black and white. We hope you’ll enjoy this eclectic collection! Skylights (obviously you need artificial lighting as well for the night time).